Josh Holloway was born on the 20th July 1969, in San Jose, California, USA. He is an actor, producer, and model, probably best known for his roles in the TV series “Lost” (2004-2010), CBS drama “Intelligence” (2014), and in the currently running science fiction show “Colony” (2016). These TV shows are his primary source of income. Holloway’s career started in 1999. Have you never wondered how rich Josh Holloway is, as of mid- 2016? According to authoritative sources, it has been estimated that Holloway’s net worth is $22 million. Although acting in highly popular TV shows significantly increased his wealth, Holloway also earned some more money working as a model and producer. 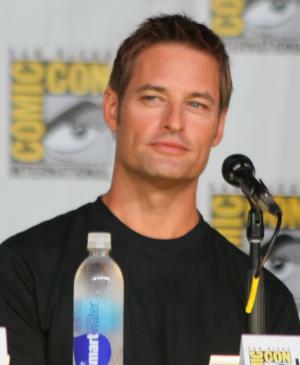 Josh Holloway is the second of four sons of a surveyor father and a nurse mother. When he was two, his family moved to Free Home, Georgia. Holloway went to Cherokee High School in Canton, Georgia, and graduated in 1987. He continued his education at the University of Georgia but had to abandon studies due to poor financial status. Holloway’s next step was moving to Los Angeles, and there pursued a modeling career at the beginning of the ’90’s. He worked as a runway and print model for international brands like Dolce & Gabanna, Donna Karan, and Calvin Klein, which dramically improved his finances, and he even appeared in the “Aerosmith” video for the single “Cryin’”. Holloway was quite ambitious and had wanted to become an actor since he was a little boy, and eventually he got the opportunity start acting, withhis debut role being in one episode of the TV show “Angel” (1999), as “Good Looking Guy”. Josh’s first movie appearance was in “Cold Feet” (2001), starring Nastassja Kinski. Soon after which he secured roles in Christopher Fink’s comedy “Moving August” (2002), and starred in Milton Brown’s “Mi Amigo” in 2002. Josh Holloway also appeared in popular TV shows “Walker, Texas Ranger” (2001), and “CSI: Crime Scene Investigation” (2003), but he gained more recognition for starring in the Sci-Fi Channel movie “Sabretooth” (2002), with John-Rhys Davies and David Keith. However, Josh became a real celebrity with his breakthrough role as James “Sawyer” Ford in the mainstream TV show ”Lost” (2004-2010). During six years of filming the series, Holloway’s schedule was very tight, and he failed to take roles in other projects, but “Lost” made him a millionaire. Still, he starred in the Stewart Hendler’s thriller “Whisper” (2007), and in the comedy “Stay Cool” (2009), with Wynona Ryder, Hilary Duff, and Chevy Chase. After the completion of the “Lost” series, Holloway was cast in “Mission: Impossible – Ghost Protocol” (2011), starring Tom Cruise, Jeremy Renner, and Simon Pegg. Two years later, he appeared in “Paranoia”, with Liam Hemsworth, Gary Oldman, Amber Heard, and Harrison Ford. Holloway’s next big movie was “Sabotage” in 2014, starring Arnold Schwarzenegger, Sam Worthington, and Terrence Howard, which films helped him to improvehis net worth. In 2014, Holloway secured a starring role in the CBS cyber-themed television series “Intelligence”. The show was aired for one season only, but helped Holloway to earn another starring role as Will Bowman in “Colony” (2016); it’s Holloways most recent role, and the show is still running. Josh Holloway’s acting skills have been rewarded with three awards, all for starring in the TV series “Lost”. The first one was Screen Actors Guild Awards in 2006 for Outstanding Performance by an Ensemble in a Drama Series. The Gold Derby TV Award in 2008 for Ensemble of the Year was the second, but the third and most prestigious is the Saturn Award in 2010 for Best Actor on Television. When it comes to his personal life, Josh Holloway has been married to Yessica Kumala since 2004, and they have two children together. 1 Fortunately and unfortunately, people don't see me as a character actor. They see me as a leading man or nothing, which makes it really hard to get work. 2 Being Southern and being the guy I've been all my life, I've lived more on the lighter side of life. I have a dark side, but that's not where I come from. A lot of artists like to come from that. 3 "When Lost (2004) took off, part of me thought, 'Do I cut and run?' I still like to look around, but respectfully and with no intentions. 'Married, not buried', I always say. If I were single?... Damn, I'd have one girl doing my laundry, one shaving me, one bringing me a cocktail and another one coming out of my tent all hung over". 4 "I was booking jobs once, maybe twice a year." - On how unlucky he was when he first moved to L.A. to become an actor. 1 Son, Hunter Lee Holloway, was born early 2014. 2 Daughter, Java Kumala Holloway, born April 9, 2009. 3 Has earned his real estate license. He said that prior to Lost (2004), he had considered quitting acting; he earned his license to have something to fall back on. 4 Born on the same day that Apollo 11 astronauts Neil Armstrong and Buzz Aldrin landed on the moon. 5 Was offered the role of "Gambit" in X-Men Origins: Wolverine (2009) but turned it down, saying the role was too close to his Lost (2004) character. 6 He is of Dutch and Scottish heritage. 7 He has been a movie-buff since the age of 3. His favorite film is The Shining (1980). 8 At around 4:30 A.M. on Wednesday, October 13, 2005, he and his wife were robbed at gunpoint in their home in Oahu. The robber took cash and credit cards, as well as stealing Holloway's Mercedes-Benz that was later dumped not far from his home in Hawaii Kai, which is about 12 miles east of Honolulu. They were shaken but unharmed. An arrest was later made in the robbery. 10 While he says it looks "cool", he admits to hating the long hair he has to wear as "Sawyer" on Lost (2004). 11 He's the second of four brothers. 12 His first job was picking up dead chickens at a farm. 13 Grew up in Free Home, Georgia. 14 After going out of his way to lessen his Southern accent to get a wider variety of work, he had to pick it back up to play the shady "confidence man" Sawyer on the hit show Lost (2004). 15 Had a successful career as a model until he got bitten by the acting bug and relocated to Los Angeles. 16 Although born in California, his family moved to Georgia when he was a baby, and he still considers himself a "Blue Ridge Mountain boy."